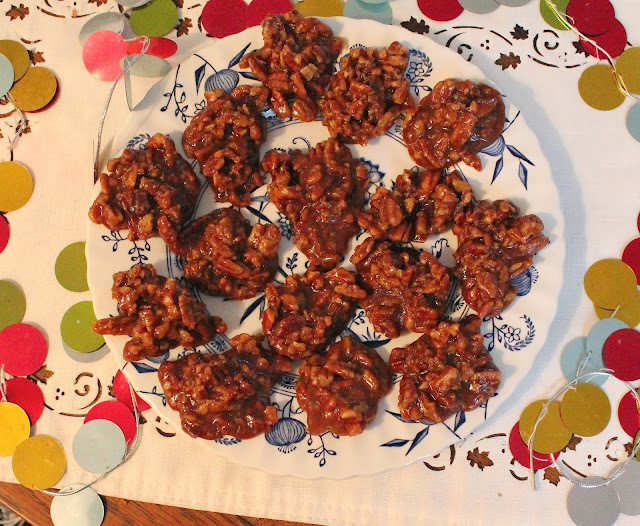 These easy candies make great hostess gifts, wrapped up in a pretty dish with ribbons. That's if you can get them out of the house before your family eats them all. But not to worry, this recipe is easily doubled. They'd be perfect on the Mardi Gras party buffet table as well. 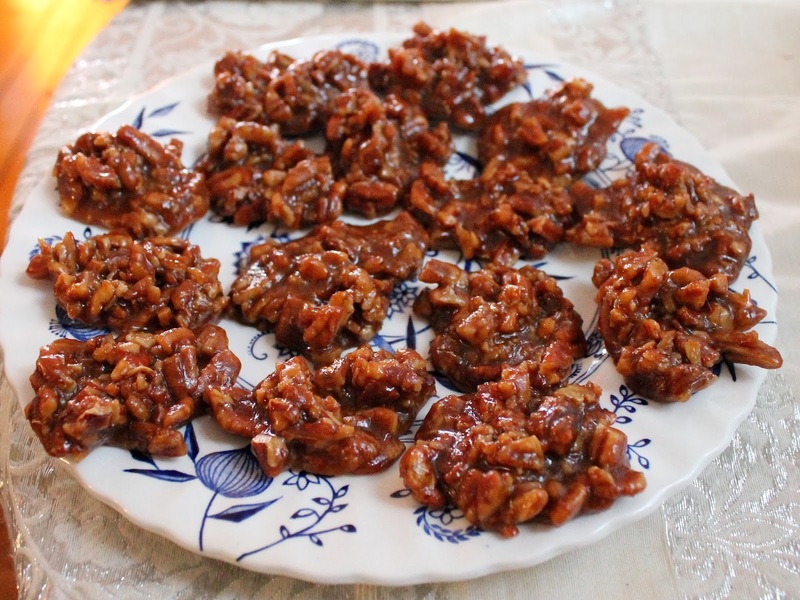 Since we are from south Louisiana, Cajun country, pralines are a favorite in our family. The hard ones, the chewy ones, they are all good! My mom sent me a message recently with this recipe saying, "Can we make these for Christmas?" So we did! Line a large baking pan with foil and butter it well. Set aside. Combine sugar, corn syrup and salt in heavy saucepan and bring to a boil. Cook to 245 °F or 118 °C on a candy thermometer. If you don’t have a candy thermometer, as I don’t in this rented house in Rhode Island for Christmas, this is called the firm ball stage. Get yourself a glass of cold water and after just a few minutes of boiling, drip a little of the syrup in the glass to test for doneness. It is ready for the next step when it forms a firm ball that can still be mashed. Check out this link for a visual. Add butter, milk and the pecans and cook to 242°F or 116°C degrees, stirring constantly. My syrup and sugar mixture hardened up when I added the milk so I just heated it gently till it melted again and stirred constantly until it was completely combined. Once again, if you don’t have a thermometer, cook the mixture until it’s thick and sticky and looks like it will hold its shape on a spoon. Spoon out onto your greased foil lined pan, working quickly. Use two spoons, one to scoop and the other to scrape the mixture off onto the foil. If it hardens up, gently rewarm till it loosens enough to spoon out again. Let cool. Makes about 15-20 pieces, depending on the size of your spoon. Or more if you make them bite-sized. I cannot believe THIS! How can you walk past the sellers and never buy a bag?!! Those sleeves were bigger than me. :) 'Course, I was a lot smaller then. Thanks for the support, Carla. They are sweet and delicious. You need to buy a few more and give them a try! Just do it, Lori! I think you'd really like them. Thanks, Courtney. I'm glad too. Everyone has been so nice. Yeah, Laura, if you don't cut the crisscross, they will indeed explode with force and a loud bang. Most alarming! Hope you give them a try! So easy! Glad to know another fan, Sarah. That's one of the pluses of marriage, getting introduced to new traditions. Thank you, Betsy! You are always so kind! Thanks, Kim. Hope you will give roasting them a try! The ones I bought said, "local" on the label, Amanda, but sometimes that just means they've come from somewhere in the region. Hope you give them a try! Glad to bring back happy holiday memories for you, Martin. Reminiscing is always fun! So delighted to be a part of this family, Isabel. You are the youngest, best matriarch ever! Sounds like fun, Conni. I've never tried hickory nuts but I like the idea of enjoying them in front of the fireplace! Most welcome, Cindy. I love them too. They are so easy to roast yourself, Kris. Do try it sometime. G'day! LOVE roasted chestnuts and have very fond memories of too! Thanks, Joanne! I need to get around to reading the other stories too. This is a crazy week!